John Wetton came to the attention of the Rock world as the Singer Bassist for Prog-Rock heavyweights, King Crimson. In 1969, King Crimson roared out of the gate on the strength of a stupendous debut album (In The Court Of The Crimson King) and a top notch front man (singer-bassist Greg Lake). Greg Lake soon left the band to form ELP. His shoes were almost too large to fill. Indeed, the band went through several incarnations and two singing bassists before John Wetton joined and brought stability back to a band that was teetering on the verge of collapse. During the seventies he was widely considered the finest (and loudest) bassist in Britain. Wetton formed Crimson’s rhythm section with (ex-Yes man) Bill Bruford and were such a powerful tag team, they routinely threatened to overwhelm guitar virtuoso Robert Fripp both onstage and on record. Wetton went on to international success as the Singer/Bassist/Songwriter in the Prog-Pop super group Asia; scoring a Billboard # 1 album “Alpha”. 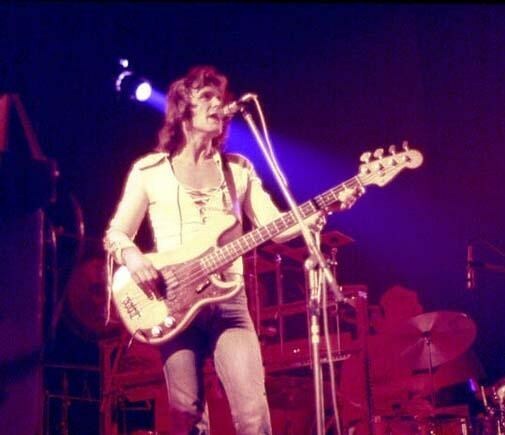 Wetton’s resume also includes stints as bassist for Roxy Music and Uriah Heap. Wetton is a major talent who has somehow remained on the B-list of Rock history. Video footage of John Wetton in his heyday is hard to find. His monumental work as both vocalist and bassist for King Crimson was never really captured on film effectively. However, the triple CD Box set “The Great Deceiver” is an improvisational feast that documents and cements John Wetton’s contributions to Progressive Rock. John Wetton makes the list because he was a superlative singer and a virtuoso bassist. He also had pop songwriting chops to burn. Here we have a great curio; John Wetton fronting a pick-up band (ex-Genesis) guitarist Steve Hackett formed to reprise some of his old band’s most beloved classics. In this case, “Firth Of Fifth”. Here Wetton covers the vocals and plays superlative bass underneath Hackett’s signature guitar solo. As great as John Wetton and Bill Bruford are / were, nobody, but nobody “overwhelms” Robert Fripp. Well, I am only going by what I read in the liner notes on ” A Young Person’s Guide’ to King Crimson and his excellent autobiography. He has often stated that he had never been satisfied about how his playing was represented on record. Also, he has commented much about the onstage dynamics of the band in the Wetton era and how it was a constant battle to get people to listen to each other onstage.”Threatening” is actually how I put it. My own impressions from the “Lark’s Tongue” show I saw, was of a great guitar player struggling to cut through…..Bruford was the player everybody was talking about on the walk back to the car…..
One of the best in Prog rock history. Great player and singer. UK was a monster band. Asia was the best…they created the new genre of progressive pop.